Macalester’s longtime Director of International Admissions Steve Colee passed away unexpectedly while on a recruiting trip in China on Wednesday, October 26. President Brian Rosenberg announced the news to the school community in a short email on Thursday afternoon. Colee, who arrived at Mac in 1984, was in his 22nd year at the college. “It’s unbelievable. I’ve known him for almost 25 years. He was the person who coordinated my interview when I was asked to interview for this job,” Lisa Bramlet, Associate Director of Admissions, said. “I came here from Virginia, and he was the person who drove me all around the Twin Cities. He was a really good, dedicated, wonderful person,” Bramlet said. Arriving in St. Paul by way of Puerto Rico and Florida, Colee, who spoke fluent Spanish, made an impression — both with the unerring passion he brought to his work in admissions, and with an understated warmth that his friends and colleagues wish more people could have known. “To people who didn’t know him, or just took him at face value, he might have seemed a little rough. But he wasn’t at all. To me, he was really approachable and big-hearted,” Bramlet said. There was no misunderstanding how much Steve’s work, the students he brought to Macalester, and the school itself, meant to him. 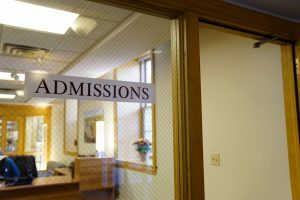 “The one thing that I knew about Steve was that I didn’t know anything that he cared about in life more than the international admissions and selecting students who he thought were appropriate for Macalester,” Aaron Colhapp, the college’s Director of International Students Programs, said. Colee worked in admissions his entire time at Macalester, but he was especially drawn to the international aspect of the job. He became the Director of International Admissions several years ago. “I was talking to his predecessor, Jimm Crowder, last week about Steve, and Jimm was just talking about how he took Steve to China for the first time and he’d never seen him as happy…soaking in the culture, from all sides of it,” Colhapp said. Colee collected plenty of stories from his travels abroad, and often brought them back to the people closest to him. “I used to think, as the Director of International Admissions, it was such a cool job to travel all over the world. While working with him, I got to know so much about the stress and exhaustion [involved in] attending sessions and interviewing students while adjusting [to] jet lag [after Colee’s] long travels, about the unpredictability and change of plans,” Wu wrote. It’s a difficult job. Bramlet said that he was, when he died, in the midst of a 40-day trip. But those trips were extremely impactful — both for Colee and for the students he met. “While most [international] students only got to meet him once or twice, for many of us who weren’t able to visit colleges in the US, Steve opened a window for us about Macalester and provided us an opportunity to learn, grow and be part of the community here,” Wu wrote. But bringing students to campus was not where the work stopped for Colee. “He also wanted to make sure international students are welcomed when they finally come to the community, for many of us, that was [our] first time living in the US,” Wu wrote. Colhapp mentioned that he would frequently check in with Colee, who always had incredibly thorough reports on students, “I don’t know if every day, but definitely every week,” throughout the year. This being one of the busiest times of the year for the admissions office, many of Colee’s colleagues and closest friends at the school—including Director of Admissions Lorne T. Robinson—have been traveling and were away when they learned of Colee’s passing. He leaves big shoes to fill. “I have no idea what they [Admissions are] going to do, because I don’t know who can fill that role right now. There are things that international admissions has to it that are different from everything else,” Colhapp said. One of those things, for more than two decades, was Colee.